You can’t go anywhere these days without seeing any sort of advertising for a fast food chain, but in an industry that brings in billions of dollars to their respective companies, fast food has become part of our daily lives. Southern California is actually home to several of the world’s most popular fast food chains, and for good reason too. While most would say that White Castle is the the first fast food restaurant, I would argue that it is the A&W Chain (now a part of Yum! Brands, which itself owns Taco Bell, KFC, Pizza Hut and Long John Silvers) which opened up their first chain in 1919 in the town of Lodi. Famous for their root beer served in frosty mugs, the chain predates the first White Castle by only 2 years. It would be another 20 years or so before the wave of restaurants came about, with the Great Depression and the early years of World War II taking up the time in between. 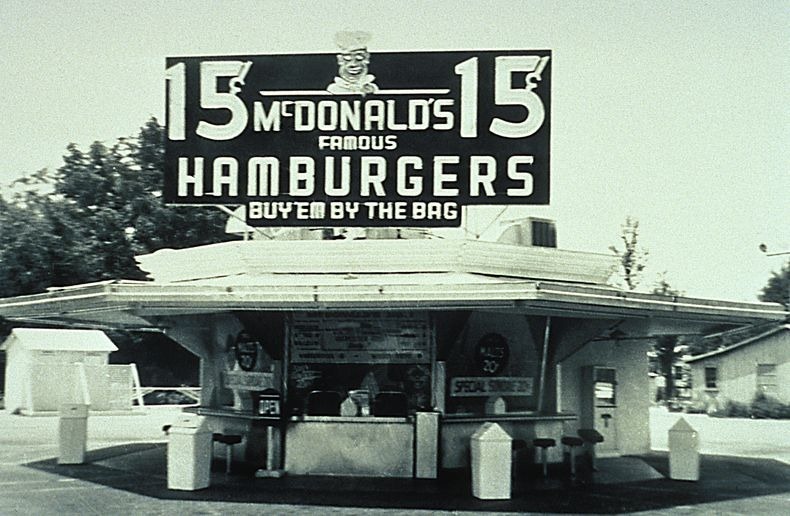 In 1940, two brothers; Richard and Maurice McDonald, would open up their eponymous restaurant, McDonald’s, in San Bernardino. While it has a strong start with speedy service and high quality food, it takes a milkshake machine salesman named Ray Kroc to help really grow the brand. Through meants either mundane or questionable. the empire of the golden arches starts to expand and now operates in over 119 countries. 1948 comes through, and from Baldwin Park, we have a chain that is almost synonymous with California: In-N-Out Burger. While they have expanded along the West Coast and parts of the midwest, the chain is another California original, and today, tourists make sure to make a stop to the closest In-N-Out location for their famous Hamburgers and Fries, which in spite of years of innovation in the fast food industry, are made with processes virtually the same as their original founding. Popular with this food writer and amongst the late night crowd, as well as one of the few chains making everything available all hours of the day, Jack In The Box opens up in San Diego in 1951. Notorious for having, getting rid of, then bringing back Jack, their iconic clown mascot, the chain is no stranger to amusing advertising and food items that appear to be inspired by stoned teenagers buying shiny things. 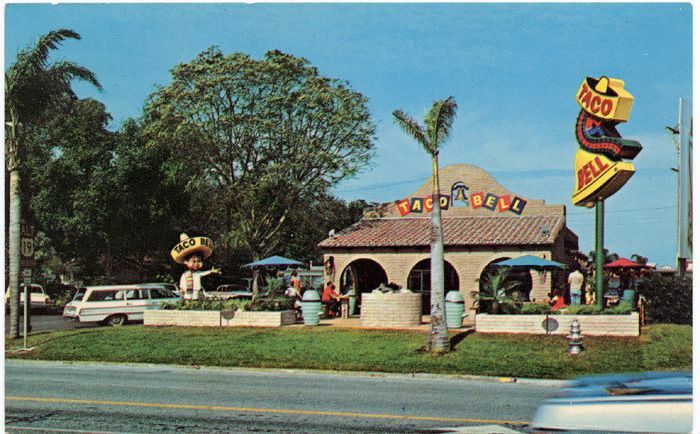 While on the topic of late night munchies, Taco Bell opened up in 1952 in Downey. While they originally served hot dogs, the current iteration was created by the owner had the idea to sell crunchy shell tacos to hungry families who may have never tried them before. How was all this growth possible? It’s all thanks to one invention, the automobile; combined with the post WW2 economic boom the nation was enjoying after years of shortages, rationing and economic depression. In addition, the post war years saw a huge increase in the dollars the US Government was spending on infrastructure, giving the nation more reliable roads for all the new cars that were being purchased. America was ready to spend money again, and fast food was just one of the many ways Americans bounced back after years of economic austerity.